The F2P mech title jump-jets onto Steam and tweaks gameplay. In PC land, Steam is the massive Atlas, looming over all competitors with its hulking laser cannons. The only games that seem to do well outside of Steam are other monsters, like Minecraft and anything from Blizzard. Now, the fast-paced mech game Hawken is making the transition from its own stand-alone platform to Steam, as well as making some changes in the new patch. While many F2P online games are available on both Steam and other platforms, Hawken is making a full transition. That means that you'll have to do a complete reinstall if you want to keep playing. On the days leading up to the Steam relaunch later in February, players should receive keys allowing them to access it before the public does. Adhesive Games has a helpful guide on all the details of the transition. 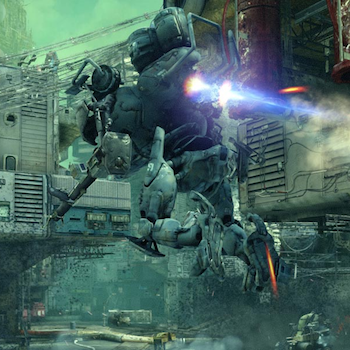 Hawken has been available in beta form since 2012. "Steam is the premier platform for PC gaming", publisher Meteor Entertainment wrote, "reaching millions of gamers worldwide and will allow us to introduce Hawken to a brand new audience." If you're a Hawken vet, prepare for an influx of fresh blood! That's not the only thing changing for Hawken, as it's also getting a new patch that overhauls the progression system, adds a new game mode, and tweaks some balance issues. For instance, Tuning Points have been completely removed. Instead of customizing the specs of each mech, each chassis has its own unique set of stats. Also, countermeasures have been completely removed from competitive play, but you can still use them against the AI in co-op mode. The full patch notes should be posted in time for the Steam relaunch.